Carhartt® Workwear Extremes® Coat. WARM 'n water-repellant coats for men! Extreme conditions call for extreme measures! 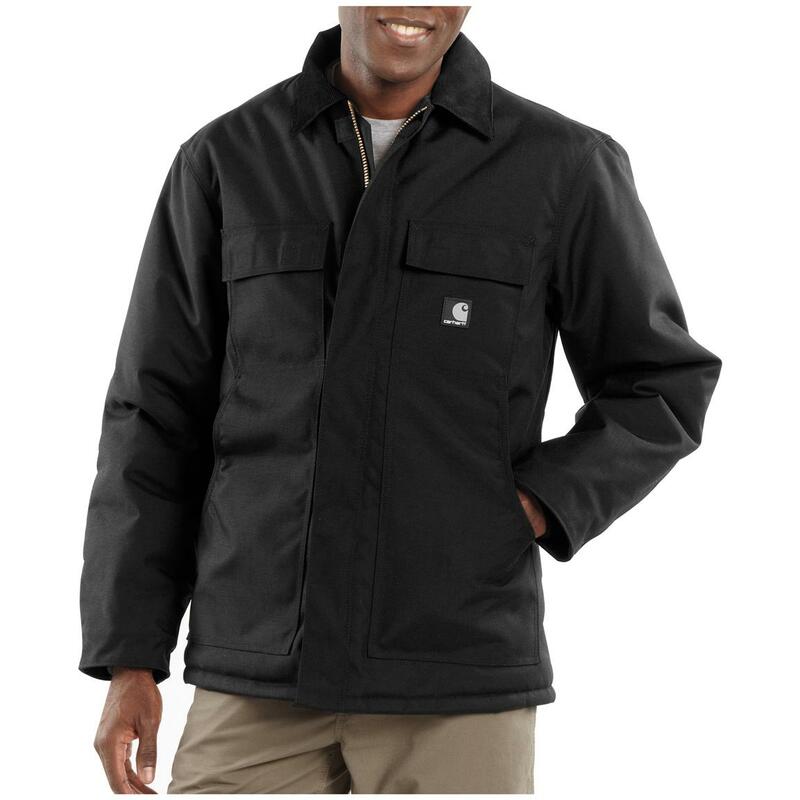 Carhartt® delivers with their Extremes® Coat that's built-tough, arctic-weight insulated, and water-repellant. This is the one you'll reach for when the wind whips and the needle dips. Mens Carhartt Extremes Coat is rated 5.0 out of 5 by 4. Rated 5 out of 5 by Bob O from Glad I discovered the C55 waterproof Extremes coat. I have been wearing the canvas duck artic weight carhartt coats for 30+ years. I loved them but hated that they would absorb water and melted snow after time working outside. You know, the wet shoulders and back after shoveling. The Extremes version with the 1000D nylon is completely dry, sheds water, seems warmer than the canvas version, and is the best protection yet for people working (or just being) outside in the winter weather. It is a bit stiff and rides up when I sit down in the truck, I'll admit that. But I don't care. It unzips both ways and I can just loosen the coat when I sit. The fabric is a little "louder" than the canvas, especially a broken in canvas as the sleeves rub against the coat. I think it makes a better windbreaker than the canvas. I am 6'5" and 250 pounds with broad shoulders and the XLT size fits perfect. I normally wear 2XT but these are cut generous, especially in the belly and waist. Be careful not to get too big or wind will get under it like a skirt. This coat is easily as well constructed as any carhartt I have ever had, despite being made elsewhere. I shrug at winter now. Oh... it has inside pockets too, which are nicer than the C003 or whatever the canvas version is.For around $10 more than the regular Carhartt canvas coat, it is well worth it. This is the real deal. Wish I could give it a 6. I may give these as gifts next year. The Extremes series is Carhartt's best kept secret. Rated 5 out of 5 by Bob o from Great product that many don't know about Great alternative to the popular C0003 canvas duck arctic weight coat. This one (C55) is made with the 1000D nylon, which makes it truly waterproof. Very well made, warm, and built to last. Takes a while to break in. Sizes run a little large. I am usually a 2XLT but Carhartt provides for larger bellies than mine. I went with a XLT and it fit perfect. 6' 5" 250 pounds. Wore the canvas version for decades working outside, I am happy to have found the Extremes version to stay drier. Drop shipped from Carhartt but was still delivered pretty quickly. Wish it was made in USA, but is made in Mexico. Still, very high quality for the price. No regrets. Rated 5 out of 5 by Brad from Very Very warm and durable. It's Carhartt.. Awesome product, quick shipping.. Very warm..